Pakistan's quality-adjusted scientific output (WFC) as reported in Nature Index has doubled from 18.03 in 2013 to 37.28 in 2017. Pakistan's global ranking has improved from 53 in 2013 to 40 in 2017. Pakistan ranks 40 with quality-adjusted scientific output of 37.28. India ranks 11 with 935. Malaysia ranks 61 with 6.73 and Indonesia ranks 63 with 6.41. Bangladesh ranks 100 with 0.81. Sri Lanka ranks 84 with 1.36. In a report titled "Pakistan: Another BRIC in the Wall", author Lulian Herciu says that Pakistan’s scientific productivity has quadrupled, from approximately 2,000 articles per year in 2006 to more than 9,000 articles in 2015. During this time, the number of Highly Cited Papers featuring Pakistan-based authors increased tenfold, from 9 articles in 2006 to 98 in 2015. British ranking agency Quacquarelli Symonds (QS) has recently ranked 23 Pakistani universities among the top 500 Asian universities for 2019, up from 16 in 2018. Just recently, there was an DAWN article by an eminent Pakistani Scientist, Mr. Parvez Hoodbhoy. Please go through the article and you will get better idea of what is Pakistani "Scientific Output" really means. Statistics from Pakistan can be misleading. 19640909rk: "Statistics from Pakistan can be misleading." The statistics I have shared in this post are not "from Pakistan". The papers included by Nature Index are "research articles published in an independently selected group of 82 high-quality science journals". And "the journals included in the Nature Index represent less than 1% of the journals covering natural sciences in the Web of Science (Clarivate Analytics) but account for close to 30% of total citations to natural science journals". Hoodbhoy is a mix of Hussain Haqqani and Cyril Almeida... a paid traitor whose job is to publish negative and socially divisive propaganda against Pakistan. If you must know, Nature Index measures "highly cited papers".. which refers to the top 1% of papers in the research field published in the world in the specified year. These are the type of papers Hoodbhoy would give a kidney for. Being an academic, he knows fully well the significance of the nature index, but he has absolutely no shame and lies through his teeth in the article. The 2002 setback he refers to is his favorite pasttime.. taking shots at the work done by Prof. Atta ur Rehman, who is probably pakistan's most renowned scientist alive and who was appointed by Musharraf as chairman of HEC. Prof. Rehman brought a revolution in higher education in the country. - Has also been made Co-Chair of UN Committee on Science, Tech and Innovation. You can compare Hoodbhoy's awards with these. Hoodboy these days is a professor at Forman Christian College. Not much of a peer position to the former HEC Chairman, Minister for Science and Technology, President of OIC's Academy of Science, and the first Muslim to receive the UNESCO Science Prize. "receiving an [award] – even if it is a high national award – would give me absolutely no sense of achievement or satisfaction... because it carries no credibility or prestige in professional circles"
He is also well known to be a bit of a sour loser. He is a well known nuclear physicist, but for some reason he was not given much of a role in pakistan's nuclear program, or if he did, his work did not get any recognition. This is probably a reason why he became a bitter opponent of Pakistan's nuclear program and even went to the extent of publicly questioning their security and the danger of their falling in the hands of extremists. At one time, when LUMS decided not to renew his contract, he went public and accused the university of not renewing his contract (which was well within the university's rights) because of a course that he was teaching about 'Science and religion'. Despite not having a shred of evidence to prove it. Despite that the fact that other professors taught similar courses on evolution and similar topics, and they never got fired. He probably was trying to use the controversy to get an offer from a western university by projecting himself as a scientist from a muslim country persecuted for his modern scientific thoughts. Signs of a great patriot. 1. His claims that HEC's policies encouraging research, publication of papers, and pursuance of Ph.Ds have turned pakistan's universities into factories producing low quality papers are absolutely false. Publishing of low quality papers just for points is much much more widespread in India and China than in Pakistan. In fact, it is a problem in every developing country where the institutional checks that prevent plagiarism and fake research are under-developed. 2. He says that when, in a bid to boost research and production of PhD degrees, the HEC significantly increased perks for faculty members, the HEC encouraged fake research is also wrong. The HEC was actually trying to prevent brain drain of highly qualified researchers and faculty from the country, riaz's article today showing that Pakistan has become the 40th ranked country in highly-cited research proves the HEC policies have worked. 3. Hoodboy says "It is time to reject the grotesque distortion of priorities and reorient Pakistan’s universities towards their major responsibility and purpose — teaching"
Scientists and academics the world over would laugh at this statement. Every top university in the west (in the world rather) focuses on research as its primary endeavor. Universities are research centers, more than they are teaching institutions. I think serving as a college professor has distorted Hoodboy's perceptions on what a university is supposed to do. Thanks for the very well thought out critique of Hoodbhoy. I share your sentiments. @Rizwan: Thanks, appreciate your kind words. Such people need to be put in their place because they only deal damage to the image of the country through their lies. 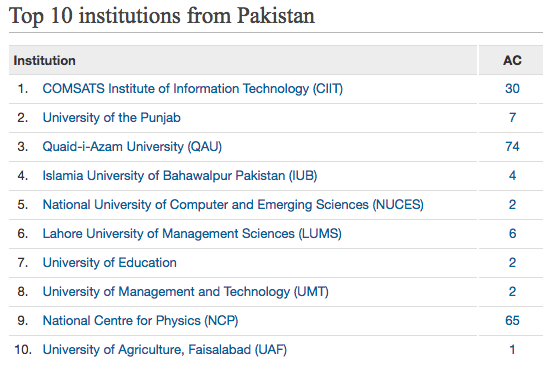 "Pakistan’s Highly Cited Papers have increased ten fold in the last 10 years. Furthermore, in the last 10 years Pakistan has emerged as the country with the highest percentage of Highly Cited Papers compared with the BRIC countries (Brazil, Russia, India and China)." So a four-fold increase in overall number of papers, but a ten-fold increase in number of highly-cited papers. This fact alone is enough to prove how false hoodboy's claims are. 2. Dr. Atta ur Rehman, whom hoodboy so regularly criticizes, also happens to be one of only 4 scientists from the Muslim world to have ever been elected as a fellow of the Royal Society in the last 350 years when the Royal Society was established, and the only scıentıst to be so recognısed for researches carrıed out wıthın a Islamıc country. Prof Rehman has close to 1000 research papers listed on researchgate, and some 10,000 citations. On google scholar his citation count is more than 17,000. He is probably pakistan's most prolific researcher alive. Hoodboy has 105 papers listed on researchgate. Funnily MOST of those seem to be on topics that have nothing to do with Physics. He seems to write more papers on social or political science issues as you can tell from the titles: "Speculations on nuclear South Asia" or "STATES UNDER SIEGE: RISING TERRORISM AND THE ASCENT OF POLITICAL ISLAM" or "Pakistan's army: Divided it stands". 3. Dr Atta ur Rehman as chairman HEC had done incredible work for the growth of higher education and science in Pakistan before his resignation due to developing differences with the PPP govt. The PTI Govt should seriously consider giving him charge of the institution once again, or appoint him as Minister for Education or Science & Technology, or an advisor the the PM on education and research. He will put the house in order. The ECNEC Meeting chaired by FM Asad Umar approved Pakistan Space Center (PSC) worth about PKR 30 billion today. This will be a high tech facility to build satellites in Pakistan in collaboration with China and will transfer this important technology to Pakistan. This is the single largest investment in civilian scientific and technological capability - about 15 years worth of development budget for Ministry of Science and Technology. Taking note of our recommendations ECNEC asked SUPARCO to produce a concrete plan for transfer of technology and development of downstream vendor industry to support future satellite development activity and a commercial plan for developing satellites for other countries. Space Vision 2047 dictates that Pakistan will spend roughly $1.5-2 billion in satellite development over the next 20-25 years and a lot of this money (and capability) should go to the private sector to enable them to compete globally in high technology exports. This and PAF's NGFA project, if done right, could be game changers for development of critical scientific and technological capability in the private sector over the next decade or two. Israel at 15 and Singapore at 16, while India at 11? That sounds right. The journals included in the Nature Index are selected by a panel of active scientists, independently of Nature Research. The selection process reflects researchers’ perceptions of journal quality, rather than using quantitative measures such as Impact Factor. Anon: "Israel at 15 and Singapore at 16, while India at 11? That sounds right." Shouldn't India compare itself with equally populous China rather than tiny Israel and tiny Singapore? Google's Head of Large Customer Marketing, South Asia, Lars Anthonisen believes Pakistan, that he describes as a fast emerging "digital-first country", will prove to be a good investment for entrepreneurs around the world. Anthonisen believes that Pakistan is on its way to "produce one of the largest digital audiences in the world" and is, therefore, a growing market for foreign investors. He listed five reasons for companies to expand their digital campaigns to Pakistan in a blog post he wrote for Think with Google, a platform that hosts expert analysis for e-commerce and digital branding in the Asia-Pacific region. According to Anthonisen, Pakistan's fast-growing population means that it has an increasing number of people that go online every day. He also refers to growing urbanisation in the country, where 40 per cent of total households live in cities. The rate of urbanisation in Pakistan is higher than that of India, which means there are more "potential customers". Anthonisen says that Pakistan's economy — expected to be the fourth fastest growing economy in the world by the year 2030 — is largely driven by small and medium-sized enterprises (SMEs). Around 90 per cent of the businesses in Pakistan are SMEs that have a 40 per cent share in the country's gross domestic product. Pakistan has a sizeable online population due to decreasing smartphone prices and cheap data packages. About 59 million people in Pakistan use smartphones, out of which 83 per cent have Android devices, Anthonisen says. As smartphone prices continue to drop, the number of users is likely to increase. As data prices are "some of the cheapest... in the world", the usage of mobile apps, like YouTube, is increasing. According to Anthonisen, the Chinese-Pakistan Economic Corridor (CPEC) programme is China's largest investment in a foreign country. One of the projects of that are part of CPEC is the laying of 820 kilometres of fibre-optic cable, that will connect more Pakistanis to the digital world. Anthonisen advises businesses to "leave a mark" on Pakistan's growing online market to grab the "endless opportunities that it can offer to investors. This bodes well for our soft image Go through profile of Lars Anthonisen. He is a big shot tipped to be future CEO of google. His ex-colleagues consider him a close friend of Pakistan and admirer of our culture. Disagree with you. Parvez Hoodbhoy always wanted to improve the educational status of Pakistan. He gave up comfortable life in USA to work for his nation. Also, he was against political loot of LUMS campus. For this, he became a hated person. As part of ECNEC/SUPARCO deliberations, the first batch of SUPARCO engineers will be dispatched for training before the end of the year. Chinese will share detailed blue prints of PRSS-1 and PakTES-1A and road maps used by Long March rocket. PAC Kamra will also be part of the engineering projects. China will also purchase future launch capabilities once Pakistan matures as a space faring nation. Pakistan’s Space and Upper Atmosphere Research Commission (Suparco), which is often criticised by Pakistani scientific community for not being on par with its Indian or Chinese counterparts, sent two satellites in space from a launching facility in China this July. While each statement merits consideration, whatever competition is going on in or regarding space between the United States and China, there are other equally strategic competitive space races going on in Asia as well. The 1967 Outer Space Treaty, signed by 107 countries including the United States, describes space as a global commons, one open to peaceful use by all countries. But space assets have considerable strategic value in both the civil and military spheres, from the detection of nuclear weapons blasts to the multibillion dollar businesses that rely on positioning and navigation data provided by systems like the U.S. Global Positioning System (GPS), making protection of those assets a national interest potentially worth fighting for. Consequently, space is also increasingly described as a warfighting domain – alongside air, land, sea and cyber – especially by the very “space reliant” United States. Those juxtaposed considerations, the rising number of private, commercial space industries, and the largely dual-use nature of space technology, create an environment ripe for multiple competitions. When the same dual-use technology is of value to both the civil and military communities, as most space technology is, and it is impossible to tell if military technology is for offensive or defensive purposes, ambiguity reigns. But to the military, capability plus intent equals threat, and with intent unclear, capabilities alone can define threats. Additionally, space prowess conveys considerable prestige that transfers into strategic influence. Consequently, government investments in space both increase regional and even global influence and open potential development opportunities through orbital information technology, and provide considerable military advantages (as first demonstrated during the 1990-91 Gulf War, dubbed the first “space war”) and the need to protect the assets providing those advantages. Therefore it is perhaps not surprising that besides the United States and China, India, Pakistan, Japan, and South Korea are all involved in space races of one kind or another. technology, while still allowing some transfer of these technologies for civil use. intention of manufacturing systems or sub-systems, but wish to access derivative services. Pakistani sounding-rocket capability to a 55-kg payload up to 450 km.